Invergordon started life as the northern terminus of a ferry across the Cromarty Firth to Balblair on the Black Isle. This formed part of a network of routes that for centuries was used by pilgrims making their way to the chapel dedicated to St Duthac in Tain. Real growth came in the 1700’s when a planned town was laid out on a grid pattern by the Gordons of Invergordon. The first real harbour was constructed in 1828, and it has been repeatedly expanded and enhanced since. From 1834 Invergordon was served by a steamer service from Glasgow, which used the Caledonian Canal and called at Cromarty en route. The deep-water port of Invergordon was an important naval base during the two World Wars. The history of the Royal Navy here dates back to the beginning of the 19th century and continued through to the 1950’s. Invergordon was used as a base for coaling and for taking on water in the middle of the 19th century and the provision of fresh water in the town, by the Navy, is commemorated with a plaque on the side of the building at the corner of the High Street and Castle Road. In the early 1900’s Invergordon became an official naval base and frequently had visits from the Home Fleet. A typical one saw twelve battleships, six cruisers, two scout ships and twenty torpedo boats with a complement of 14,500 men visit the firth. 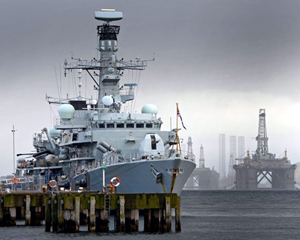 During the First World War (1914-18) Invergordon was a full-scale base for the Royal Navy, providing fuel oil, water and dockyard repair facilities in what has often been called the best natural harbour in Europe. It was during this period the hospital was built, at the eastern end of the town. During the war there were probably 20,000 people living in and around Invergordon and other military camps ringed the firth. On 31st December 1915 the cruiser HMS Natal was hosting a reception for local dignitaries off Invergordon when, for reasons never satisfactorily explained, it blew up and capsized, with the loss of over 300 lives. 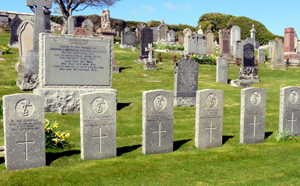 Some ‘Natal’ gravestones can be found in Rosskeen Churchyard at the western end of the town. The Natal Garden is not only a lure in itself but also a fond memorial to the souls who perished. 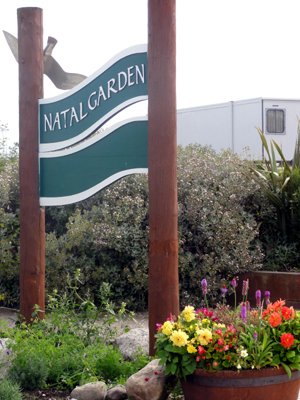 The gardens were improved under an initiative which was undertaken as a project for the BBC series, Charlie’s Garden Army, and involved a huge community effort. Under the Defence of the Realm Act 1916, all the licensed premises in the town were taken over by the State. During the Second World War (1939-45) the Firth was not considered safe for the Navy as it was within flying distance of hostile forces on mainland Europe. It then became a base for flying boats, with a maintenance base at Evanton, a training base at Alness, and three squadrons of aircraft based at Invergordon, patrolling as far as Shetland and the southern Norwegian coast. There were still visits by the Royal Navy however, especially for joint target practice with the Sunderland flying boats. Evidence of the Navy remains in the tank farm lying behind the town centre, which used to contain fuel oil and water for admiralty ships, and the Admiralty Pier, where warships docked and which is now used for cruise ships in the summer and oil field support vessels through the year. One German bomb hit one of the tanks during World War II when a large flying boat base occupied much of the northerly coast of the Cromarty Firth, the result of this being that the fuel oil flowed onto the railway tracks. According to town history the bomb did not explode. From the late 1950s, Invergordon became a centre for the production of grain spirit, with a major distillery that resulted still dominating the eastern side of the town. The naval base closed in 1956, but it was not until 31st March 1993 after the Falklands War, that the Navy’s ties with the port ended. Attracting Industry post Navy: During the 1950’s several attempts were made to bring industry to the Highlands north of Inverness: Invergordon Distillery was one. It was vigorously promoted by James Grigor, Provost of Inverness, with good reason: communications by sea and road were excellent, the port was on the edge of a notable barley-growing district and the water was first rate. Invergordon Distillers Ltd was incorporated in 1959 and the distillery commenced production in July 1961 with one Coffey still producing 10,000 gallons of pure alcohol a week. Two further Coffey stills were installed in 1963, and a fourth in 1978, with an extra column to produce industrial alcohol. 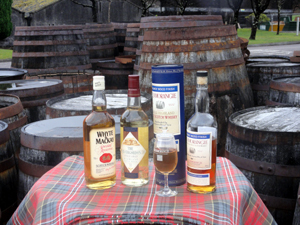 Since 1993, the distillery has been owned by Whyte & Mackay and continues to produce the finest grain whisky. Invergordon Grain Whisky is a component of many blended scotch brands and can be found as Single Grain Whisky in some specialist retailers. The Invergordon site has over 1,000,000 barrels of maturing whisky in its warehouses and produces 40,000,000 litres of alcohol every year to be filled into barrels for maturation. Aluminium smelter: Less successful was the Invergordon aluminium smelter, constructed from the end of the 1960’s. This employed nearly 2,000 people during construction and around 1,000 people at its peak of production, but was probably an enterprise whose demise was inevitable from the start: the costs of transmitting the electricity needed to smelt bauxite imported by sea from Jamaica simply made the operation uneconomic. The smelter was closed in 1981. The pipeline that covered the conveyor belt from the smelter to the BA pier was not dismantled until the early 2000’s and the two large tanks still stand today as well as a water tower. Since the 1970’s some would perceive the town as a 'Glasgow colony', since many workers were recruited from southern Scotland to work in the oil rig fabrication and aluminium smelting industries. As a result, the residents' accents often show more influence from Glasgow, than the surrounding Easter Ross dialect of Highland English although this has changed in recent years. The town has also been heavily involved in the North Sea oil industry. 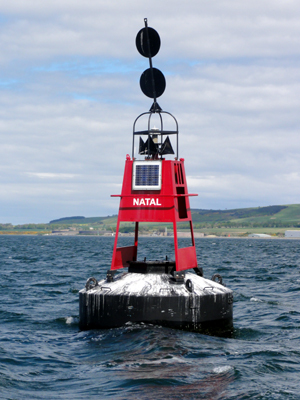 It has seen boom and decline but it remains an important centre for the inspection, repair and maintenance of oil rigs, a number which have been mothballed and can usually be seen in a line along the Cromarty Firth. Those actually undergoing work dominate the town. Many oil rigs were built in the huge fabrication sheds at Nigg to the east, before being assembled in the waters of the Moray Firth and towed out to sea. Full scale commercial oil extraction began in the North Sea in the mid 1970’s and from this ‘black gold’ and Invergordon’s ‘liquid gold’ the industry in this sheltered haven has made a substantial contribution to the UK economy over the last 50 years. 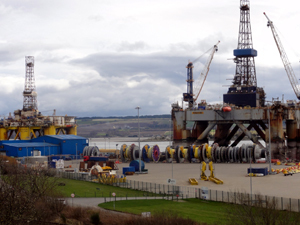 The yards at Invergordon have more recently been used to repair or decommission oil rigs and those at Nigg have been used to build wind turbines. Invergordon, with its fine natural harbour, is a key port at the mouth of the Cromarty Firth and has a proud maritime history. Now, in the 21st century, each year it welcomes an increasing number of large cruise liners which take advantage of the port’s beautiful setting and central location to explore the Highlands. Fishmeal, shipped from South America, is transported from the quayside to a customs controlled storage facility. Coal, road salt and grain are also imported. Various other oil related activities are on-going, but you can also stand a very good chance of seeing bottle nose dolphins riding the bow wave of the ships as they are piloted in. The Port of Cromarty Firth became a ‘trust port’ on 1st January 1974, created by an Act of Parliament, with responsibility for all marine activities in the Cromarty Firth, up to the high water mark and extending from the Cromarty Bridge in the west to a line two miles (3.2kms) out into the Moray Firth, beyond the Sutors. The Port was keen to take over the Invergordon Service Base so that they could develop its full potential. By May 1982 the Beatrice Consortium and the British National Oil Company (later Britoil) had agreed to the sale and the Moray Firth Service Company Limited (a joint venture company between Aberdeen-based Wood Group Caledonian Towage Company Limited and the Port Authority was set up to run the base. The first rig to undergo major repairs at the service jetty (Sedco 700) came in 1983 and by September 1983 there were six rigs in the port area and a further seven expected before the turn of the year. As a result, there was an urgent need to further expand, so a wet dock was constructed, known as the Queen’s Dock. Unfortunately, depression in the oil industry led to poor financial results and so, by mutual agreement, the port terminated the lease in the early 1990’s, but with concessions to the Company, allowing them to continue to provide on-shore facilities and logistical services. In 1993 the new berth was completed and within a few days of completion it was occupied by Sedco 714. At the time, the workers in the Queen’s Dock and the nearby berth would spray drilling towers with gay abandon but, when a number of nearby cars had to be re-sprayed, at great expense to insurers, because of flying bits of paint from the rigs, it was realised that all rigs would have to be sheeted to protect the surroundings (and cars!!). Through working successfully with other business the Port has played an important part in establishing the firth as a principal UK location for the inspection, repair and maintenance of drilling rigs. By 1998 more than 400 drilling rigs had visited the firth for a whole range of wrk, from routine inspection, repair and maintenance, to major overhauls. In 2008, the 600th rig arrived. In 2014, Invergordon was a leading port in Europe for oil-rig inspection, repair and maintenance, and the subsea industry more generally. In March 1992 a new roll on/roll-off ferry service (Orcargo Limited) was seen as a great opportunity. The ferry link from Orkney meant that drivers could get to the central belt within their allowed driving hours because they could rest on board ship. It was potentially very expensive to put in the infrastructure, but the Port Authority’s outlay amounted to around £250,000 instead of the millions it may have cost, due to the imagination of the then Port Manager, when he bought a linkspan bridge from Harwich and coupled it with an old barge to create the cheapest linkspan in the country. Thousands and thousands of sheep and cattle travelled the route, and there was also space for twelve passengers on each trip – often tourists – who loved it! The service ended in 2001 with the removal of the subsidies to run it. In recent years, Invergordon has offered an interesting new attraction or two for visitors. The Invergordon Naval and Heritage Museum is worth a visit interpreting, as it does, the story of the British Navy’s only mutiny in 1931. 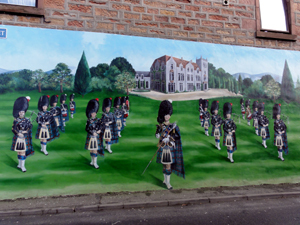 Another attraction in the town is the fascinating murals which can be seen on buildings throughout the centre of Invergordon. The mural trail offers an eye-catching outdoor art attraction. It illustrates the rich, diverse history of the area, the events, people and industries which have helped shape the town over the decades and centuries. A group was set up, in January 2002, and set out to emulate the success of the Canadian town of Chemainus, British Columbia which, like Invergordon, had lost its major employer. They came up with the innovative idea of creating skilfully executed murals. Currently the town is adorned with a series of 11 murals. The trail was opened by the Princess Royal in August 2008. For the more athletic we have an 18-hole lush parkland golf course which can boast a stunning setting with superb views. There is also a sports centre with indoor swimming pool, as well as cycle tracks and circular walking paths. Additionally, there are football and rugby pitches, a skatepark and a bowling green. 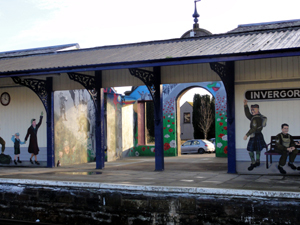 The current population of Invergordon (2011 census) is 4,075. Balcas: is one of Britain and Ireland’s largest wood product suppliers. The group has some 360 direct employees; in addition, 300 people are engaged in forest harvesting and haulage. 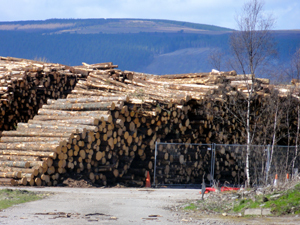 Balcas operates from several sites: a sawmill in Enniskillen, an architectural mouldings factory in Kildare, and Combined Heat and Power plants in Enniskillen and Invergordon. The Invergordon plant commenced construction in 2007 and opened in 2008. The pellet plant produces around 100,000 tonnes of brites annually and also supplies electricity to the National grid. Kirker (Europe) Ltd. manufactures and bottles nail products such as nail polish. The company manufactures products for brands such as Revlon, Avon, and Boots. Kirker, based in Invergordon, was founded in 1998 and can claim to be Europe’s largest manufacturer of nail polish. They currently employ over 100 people. 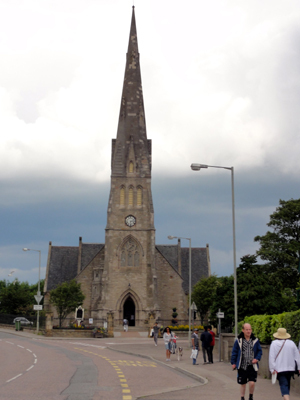 Invergordon Parish Church is a building of exceptional dignity, in a commanding position in the town. It is in the parish of Rosskeen, Easter Ross, whose parish church was over two miles from the town. After the Disruption in 1843, the established Church of Scotland lost many of its members in the area to the new Free Church. The Rosskeen Free Church congregation eventually built a church, close to the parish church, but not convenient for Invergordon, so the townspeople built a new Free Church in 1859-60. The building was designed by Ross and Joass of Inverness, the leading Highland architectural practice of the time. Invergordon was not an ancient settlement, and had been founded by a local landowner in the mid-18th century. In the early 19th century Thomas Telford designed a small harbour for the place. Easter Ross has a relatively dry and mild climate, very suitable for growing grain, and much of the trade of Invergordon was in corn for export. The repeal of the Corn Laws in 1849, which protected home-grown grain from foreign competition, hit Scottish arable farmers very hard, especially when new areas in central Europe and North America were developed for wheat production. Invergordon Free Church was built just before foreign competition became really serious, and the building was on a scale which could not have been justified a few years later. The church was opened in October 1861 and had cost a total of £2,500 to build. (Later, the manse, spire clock and hall were added, and, with the addition of the gallery, the church attained its present appearance in 1895.) Ewing’s Annals of the Free Church of Scotland notes that the population of the town declined in the later 19th century. Unlike some other Free churches in the area the Invergordon congregation entered into the union of the Free and United Presbyterian churches in 1900, and as a United Free Church congregation into the union with the Church of Scotland in 1929. The church is one of a group of big Gothic Revival churches in the eastern Highlands built by the Free Church between 1843 and 1900. At first glance they may look ‘all the same’ and be dismissed accordingly, but are, in fact, remarkably varied. The largest and most elaborate is the Free North in Inverness (still a Free Church), but some suggest that Invergordon is the finest. What is really striking about it is the height and elegant simplicity of the spire, which dominates the town. A fine building, by any standards, it is an effective monument to what the Free Church fought for in the 19th century - freedom from landowner interference in the running of the Church, something which is taken for granted today in the Church of Scotland. With its magnificent soaring spire it is also a striking reminder to all visitors to Invergordon of the continuing importance of the Church of Scotland in the life of the eastern Highlands. Invergordon lifeboat station opened in 1974. To date, the lifeboat and her crew of volunteers have launched many times to those in distress and, as with every RNLI lifeboat station around the coast, are available at short notice. The present lifeboat, the ‘Douglas Aikman-Smith’ is a Trent class. At 14 metres long, the boat has two 860 horsepower diesel engines which give a boat speed of around 25 knots. The cost of the boat (£1.2 million) was funded from the legacy of a ‘Douglas Aikman-Smith’ who owned a dry cleaning business, in Dumfries. Britain of 1931 was in the first throes of the Great Depression. Economic stagnation had led to mass unemployment with the number of people out of work having more than doubled to 2.5 million during the previous year alone, homelessness was rife, and those who still had work were faced with enormous pay cuts. The heavy burden of retaining the prestige of British capitalism was placed upon the back of the working class, and millions of people were facing head-on the blunt misery the Depression was to throw upon them for years to come. The government, wishing to create savings in public spending, put forward of series of pay cuts to be enforced in the public sector, including cuts to the Armed Forces. On the advice of a government committee appointed to identify areas in which public spending could be cut, new pay rates were put forward for the Royal Navy. Officers, NCOs and those who had joined after 1925 were to receive a cut of 10% and ratings below the rank of petty officer who had joined before 1925 would have their pay reduced to a new rate, in most cases this amounted to a 25% cut in pay. Recruitment to the navy was particularly high in large industrial centres which were experiencing massive unemployment, and, faced with the hardships of the time, these cuts essentially condemned many sailors and their families to poverty. Rumours of the pay cuts had been circulating around sailors of the Atlantic Fleet by early September, while the fleet was on manoeuvres in the North Sea. These rumours were soon confirmed when the group of ten warships (Adventure, Dorsetshire, Malaya, Norfolk, Repulse, Rodney, Valiant, Warspite, York and the flagship HMS Hood) docked on the 11th on the Cromarty Firth in northern Scotland. Taking leave in the nearby town of Invergordon, the sailors became fully aware of the extent of the cuts from newspaper reports, and later from confirmation from the Admiralty. 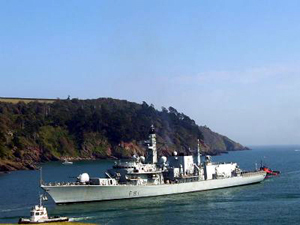 Recognising the disastrous effects that these cuts would have upon themselves and their families, especially for those facing a 25% loss of pay, the sailors became convinced that positive action was needed. Agitation amongst the crews began almost immediately and on the evening of the 12th a group of sailors held a meeting on a football field in Invergordon and voted in favour of a strike. Singing the Red Flag, the men left to spread the news among the others and to make preparations for the action. Several meetings were held in a canteen in Invergordon on the 13th with hundreds of sailors in attendance, many climbing on tables to make impromptu speeches in favour of the strike. Upon hearing of the meetings, fleet commanders dispatched patrols of marines to break up the meetings and shut the canteen down early, which they did, although more speeches were made on the pier and on the decks of ships as sailors returned, many ignoring orders to disperse. Four more warships docked on the 14th and meetings were conducted throughout the day, with crews from the newly arrived ships taking part. Marines were dispatched again in the evening after reports of "disorderliness" on shore reached Rear Admiral Wilfrid Tomkinson, temporary commander of the fleet at the time. The strike was to take place on the 15th, a day designated for practice manoeuvres. When ordered to put to sea that morning the commanding officers of four of the ships were met with flat refusal from their crews. The crews of HMS Hood, the fleet's flagship, and HMS Nelson carried out harbour duties but refused to put to sea, and the crews of HMS Valiant and HMS Rodney carried out essential duties only and simply ignored other orders. Sailors gathered on their ship's decks, cheering and using semaphore signals to indicate to each other that the strike was in effect. Only four ships had put to sea, and three had to return to dock after several hours for lack of crew members who were willing to obey orders. Sailors conducted further meetings on decks with regular intervals of singing, a piano being dragged on deck from an officer's quarters on one ship as an accompaniment. The strikers were joined by many Royal Marines, essentially the police force of the Navy who were usually expected to break up disturbances such as this, and some Petty Officers. Over a thousand men had taken part in the strike, and it was successful in forcing the fleet commanders to abandon plans for the manoeuvres. Tomkinson telegraphed the Admiralty in the afternoon explaining the situation and insisted that any restoration of order would be impossible without immediate concessions to the strikers. An Admiral Colvin was dispatched by Tomkinson on the morning of the 15th, with the job of taking the sailor's grievances to the Admiralty. Not expecting a reply for several days and wishing to halt the spread of the mutiny, Tomkinson ordered concessions to the strikers. These included extending marriage allowances to sailors under the age of 25, and that those on lower rates of pay could remain on the old rate, effectively cancelling the 25% pay cut in favour of a universal 10% cut. On 16th September, in Whitehall, the cabinet considered the complaints of the sailors and a pay cut of 10% was broadly agreed. On hearing this news later in the day all ships sailed from Invergordon heading for their home ports. A highly embarrassing incident for the Admiralty and the government, and fearing repeats of the mutiny from other sections of the armed forces, attempts were made to suppress any record or public knowledge of the strike at Invergordon. The government refused to hold an inquiry and public court martials for strikers were forbidden. Strikers were punished out of the public eye however, many were jailed, and many more punished in barracks and then dispersed throughout the Navy. Once normality had returned a naval investigation was commissioned resulting in a group of some 200 sailors being dismissed from the Navy. The backlash of the strike was not just confined to the forces. The offices of the Daily Worker, the Communist Party newspaper which had lent its full support to the strikers, and indeed one of the few newspapers to report on the strike, were raided. Its printer, business manager and a member of its editorial board were arrested under the Incitement to Mutiny Act. News of the strike did, however, reach some sections of the population, and it preceded and most probably acted as an inspiration to a massive demonstration in London against public sector cuts, as well as marches and riots of 50,000 and 30,000 members of the Unemployed Workers Movement in Glasgow and Manchester respectively. While not completely halting the tide of pay cuts that was to affect the Navy, the daring and well organised actions of the strikers, not to mention the massive show of solidarity and comradeship shown between them, certainly lessened the impact of the cuts and should be remembered as a proud chapter in the long history of mutiny and rebellion in the Royal Navy. The Cabinet accepted Tomkinson's recommendation that ratings on the old rate of pay remain on that rate, with a 10% cut in line with the rest of the service. It was made clear that further acts of insurrection would be severely punished. A number of the organisers of the strike were jailed, while 200 sailors were discharged from the service. A further 200-odd sailors were purged from elsewhere in the Navy, accused of attempting to incite similar incidents. The Admiralty held Tomkinson accountable for the mutiny, blaming him for failing to punish dissidents after the first protests. The Atlantic Fleet never fought in a naval battle in its short history. Having been shaken by the events of the Invergordon Mutiny, the Admiralty renamed the Atlantic Fleet, as the Home Fleet. The mutiny caused a panic on the London Stock Exchange and a run on the pound, bringing Britain's economic troubles to a head and forced it off the Gold Standard on 21st September 1931. Len Wincott, a leader of the mutiny, defected to the USSR in 1934. During World War II he survived the Siege of Leningrad (September 1941 – January 1944) but in 1946 he was sent to the Gulag after being accused of being a British spy; he was imprisoned for more than a decade. After his release in the 1950s, he became a friend of Donald MacLean, a British diplomat and member of the ‘Cambridge Five’ who acted as spies for the Soviet Union, in Moscow. Another leader, Navy boxer Fred Copeman, commanded the British Battalion of the International Brigades in the Spanish Civil War (1936-1939).